The $15 minimum wage bill lawmakers are fast-tracking to Gov. 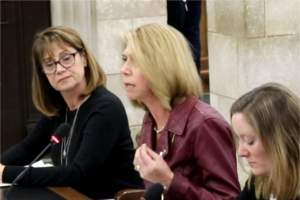 Phil Murphy’s desk will put small businesses in a bind, and that’s bad news for the 600,000 workers employed by them, NJBIA President and CEO Michele Siekerka told the Assembly Labor Committee today. The committee was taking testimony before voting to release A-15, the legislation that would raise New Jersey’s minimum wage to $15 an hour by 2024. While the legislation is supposed to help those making low wages, Siekerka pointed out that it will in all likelihood do the opposite for many of them. “According to the U.S. Small Business Administration, 600,000 workers are employed by New Jersey companies who employ 20 employees or less,” she said. “These are the companies most vulnerable and, in turn, so are their employees. NJBIA has historically opposed any increase in the minimum wage and will continue to oppose this one. But with the majority in both houses and the governor determined to enact a $15 minimum wage, the association has pleaded with legislators to do so responsibly. “This bill falls woefully short” by that measure, Siekerka said. Among other things, the bill ignores the possibility of a recession or natural disaster in the near future by not including a mechanism to halt automatic wage increases. “Even California realized the need to enact a similar economic safeguard when it decided to raise its minimum wage to $15 an hour,” Siekerka said. The bill also does not come anywhere near doing enough to protect small businesses nor does it provide relief for businesses that participate in training programs or a broad enough exemption for seasonal workers. Ultimately, however, the legislation does not give credit to the employers of New Jersey who do what they can for their employees despite New Jersey’s dismal business climate. You can buy an awful lot of technology to avoid paying $15.00/hour. It is hard to imagine that the cost of gasoline will not go higher because of this raise. The least thing that they should do is relieve us of this burden and allow for self service gasoline. Vince, there is a ripple effect that is much larger than the gas station attendant. You make a great point and automation is coming – that much faster with this. Any employee is going to expect a raise as the “new guy” is getting what I’m making comes into play. I am 100% withyou on this Larry. I even asked a DOL Wage and Hour employee this same quesiont years ago and he said they were told to lay off these same issues I have argued for years. It’s a losing battle. If they do get “slapped”, the fine is so minimal its rediculous, yet these owner operators are the ones with all their toys, vacation houses, etc. living large. What about people from PA coming to NJ to earn $15? Their current minimum wage is $7.25! And because of our reciprocity regarding income tax, a PA resident would pay PA income tax, not NJ. That means for every PA resident that gets a job in NJ, NJ would not get that income tax. This is a disaster. Ellen, this is part of the BIGGER PICTURE THAT NEW JERSEY HAS TO LOOK AT. What company won’t look at Pennsylvania after this for relocation? New Jersey is losing again. What they really need is to train people in a greater way so they are worth the raise – not an entitlement! Education in partnership with companies that want to hire so that people know where they can go and be ready for it when they graduate. The challenge is how do you help the group of people who are now falling into the cracks. Take away their cable for starters or limit it – ok, maybe that’s too far. However, when company owners tell me about their Pickers and Packers and how much TV they watch, I wonder. John, the reality is the politicians are counting on many comfortable company owners who don’t want to change their lifestyle and get up and move. They are counting on it far, far too much! Our business has already started looking at industrial buildings for lease in PA. Prices are cheaper to begin with and most of our raw materials are coming from there already. We don’t have ability to pass along increases. We have been losing work to offshore already and certainly don’t expect that to change. You can already see large corporations automating to eliminate minimum wage jobs . Just look at McDonald’s ordering kiosks and Labcorps self check in. All jobs that would have been done in the past by an entry level worker . As Trenton continues to over regulate the business community of New Jersey you can expect more of these jobs to disappear. Well, well, Mr. Murphy got his way, what a surprise! Unbelievable, I guess our legislature and all the excess government officials we elect in this state have no pool what so ever. They are too busy coming up with stupid laws that mean nothing. Hey Murph- Now maybe you will start cutting the excess fat in NJ Government and STOP spending money in this state. Surprising that a thief and cheat like Bob Menendez, gets re-elected and is Murphy’s boy and all of us small business owners get screwed. I am looking to move out of this state asap. PA is looking better every day. Congrats Mr. Murphy and all of you who voted for him. I’m a small business owner who “hired” high school kids for summer jobs . No more!!!! You just killed me!!!! And my employees better start getting use to doing twice the work . As a small business for 83 years in NJ, I am embarrassed to say I have a business in this state. People laugh at me for being so stupid when I declare that fact. These are good businessmen that golf together so they speak the truth. I think all encumbents names in our legislature should be published and VOTE THEM OUT ASAP to save our state from Socialism which is getting popular these days so the politicians can pander for votes. I’m sure my business can not afford these stupid ideas and I am looking forward to leaving this socialist state. I used to be proud but no more I’m embarrassed. So long NJ. I’m not saying don’t try but I wont work they are just buying votes. Think about 1 business owner just got made and is going to vote against them. The 20 employees will vote for them because they gave them more money. Our general population does not think past what can I get. Our government has become royalty and everyone else is just their subjects. The new minimum wage, will cost my business at least 40K. That is the cost of my high school employees yearly. I will need to cut my part time employees. Watch the unemployment rate in New Jersey double. 27 year business use college student summer help to run parts around. Sorry no more they were very happy at $10 an hour take truck home. Run in am to parts houses then to jobs. No more. To every entrepreneur here, as am I, if you think free enterprise exists in NJ you are sadly delusional. The clearly inept government in Trenton, who can’t run the government ( including successful budgeting) is running your company not you. They decide how much you need to pay your employees, what health benefits you need to provide, paid sick time, paid leave… If they ever decide to leave the comfort of their safety bubble they would see the true struggles we small business owners face. Thank God retirement is not far off for me, I see no hope for small business survival in NJ. We hold many national records, however few are for the good of the NJ resident or small business owner. You think outmigration of people and businesses was high before just wait with this new mandate. Business, leave nothing good. If you think things will change and you can wait it out you will be bankrupt! Trenton and all the idiots there do not care! LEAVE! Small business owners like me try to help maximum possible people by employing them. The most affected industries are going to be service industries. The only option for survival is cut down the major expenses. Means cut down the number of employees or move the business to nearby state or close down the business. All three measures contribute to increase in unemployment. I think law makers look at long term effects of their decision than their short term individual benefit or popularity. Employees will be happy by this decision now but soon they will turn the table when they will start loosing their jobs. Once this damage is done their is no repair for ever.